Leah and Simcha Goldin have left their rather satisfying but simple lives in Kfar Saba, Israel and are now traveling the world on a campaign. And that campaign is an all-out effort to pressure the terror group Hamas in Gaza to return the body of their son Hadar for proper burial in Israel. Hadar and one of his comrades in the IDF, Oron Shaul, were killed by Hamas just as an internationally arranged ceasefire took place during those almost two months of war against Hamas in Operation Protective Edge in the summer of 2014. The terrorists who killed Hadar and Oron hurriedly dragged their bodies down into one of the many underground tunnels and whisked them off deep into Gaza. There was a frantic effort to retrieve the bodies, with significant infantry, helicopters, and bombing runs attempting to stop the effort to kidnap the bodies, but the endeavor was not successful. Unfortunately, events along these lines have played out far too often in Israel over the years. This is just the latest tragic episode. Something, however, is different today than any time in the past. It is now Israel’s policy not to trade Palestinian prisoners being held in Israel’s jails. Nor will they trade for soldiers’ bodies like they have done on more than a few occasions. So Leah and Simcha Goldin are making the rounds, visiting with officials here in New York and in Washington, DC, hoping that someone out there will have the contacts, the desire, the willpower, and the ability to reach out to Hamas and prevail on them to release their boys’ bodies on humanitarian grounds. The most noteworthy trade for soldiers’ remains was the exchange with Lebanon in 2008 for the bodies of Ehud Goldwasser and Eldad Regev, who were killed in an ambush by Hezbollah. The two were murdered instantly by their captors and then held for two years until a swap was arranged—the two coffins for over 1,000 Palestinians in Israel’s jails for terror-related offenses. And then a few years ago there was the exchange of a very-much-alive Gilad Shalit also for more than 1,000 Palestinians. This trade was done with Hamas after long on-again, off-again negotiations over a five-year period. The Shalit situation was a classic case of gut-wrenching mixed emotions. There was young Gilad—held in secrecy with limited exposure—but we knew that he was alive. On the other hand, as negotiations became serious, Israel had to make difficult decisions about releasing terrorists from prison, some of whom would inevitably return to perpetrating terror acts and killing Jews. And that possibility has come to fruition over the last several years with at least six Israelis murdered in terror acts, at last count, committed by those released in the Shalit deal. I recall more than one meeting with Noam Shalit, and also observing him sitting in Jerusalem inside a protest tent in front of the prime minister’s office, urging that the government negotiate with Hamas for his son’s release. What should he have done? Say that it is OK to kill his son for the greater good of the future? Very difficult. Leah Goldin does not agree with me about the comparison to the Shalit situation. There was a different dynamic at play in that case. Shalit was alive, and the knowledge of that reality tugged at the heartstrings of Israeli society. Here Hadar and Oron are dead. All the parents want is to bury their children. How brutal and uncivilized can people be? There is apparently no end to the inhumanity, even at this advanced stage, in the relations between countries around the world. So with no hope of a trade of hundreds or more than a thousand terrorists for the bodies of Hadar and Oron, the Goldins are left to appeal to the conscience of the world. To that end, they had hoped for face-to-face meetings with Secretary of State John Kerry and UN Secretary General Ban Ki-moon. It is vital to note that the ceasefire in August 2014 between Israel and Hamas was arranged through the joint efforts of Mr. Kerry and Mr. Ki-moon. Both sides committed to cease hostilities for humanitarian purposes, which included the opportunity to evacuate the wounded. The Israel military, being a professional and honest fighting force, adhered strictly to the ceasefire, which also allowed the soldiers to at least temporarily relax their guard. That was a big mistake, because just several minutes after the truce went into effect is when it was violated by Hamas, which resulted in three IDF men killed and the two bodies taken hostage. The Goldins, through their contact with and the assistance of UN Ambassador of Israel, Danny Danon, could not manage to arrange for a meeting with Ban Ki-moon. His office told the Goldins that he had a scheduling conflict, which is both disappointing and reprehensible. The Goldins and Ambassador Danon did, however, meet with the secretary general’s chief of staff. “In our meeting with the chief of staff, we received humanitarian recognition for the need to return Hadar and Oron to Israel, and an official announcement will soon be released on the topic,” Simcha Goldin said. Unfortunately, he may not understand that those are signals indicating that either nothing, or, at best, very little, will ever be done by the UN on this matter. The Goldins have also been to Washington where they met with members of Congress, including Ileana Ros-Lehtinen of Florida and Elliot Engel of New York. They say they were well received, and Ms. Ros-Lehtinen took to the floor of the House of Representatives with a photo of Hadar in order to have his plight recorded in the Congressional record. With no trade for a large amount of Palestinian prisoners in the works or even possible, the Goldins are hoping that somewhere they will curry favor with someone who can either pressure or who can speak with Hamas officials on a human-to-human level. In the meantime, economic aid keeps pouring into Gaza to support the population that is being ruled by the terrorist regime. “Israel is the only country in the world that supplies its enemy with lifesaving supplies even as a war is ongoing,” says Leah Goldin. And that indeed was the case in the summer of 2014 as scores of trucks made their way into Gaza with supplies from Israel, even as rockets were being fired out of Gaza into Israel’s population centers, killing and injuring citizens. At the same time, Israel continues to return the bodies of terrorists who seek to knife, shoot, and run over Israelis on an almost daily basis. The Goldins feel that Israel can use the terrorist bodies as a bargaining chip by withholding the bodies until Hadar and Oron are released. But the Netanyahu government has rejected that option, feeling that most of the attackers are lone wolves and not necessarily identified with a specific terror group like Hamas or Islamic Jihad. And additionally, Israel feels that holding on to the bodies of the Palestinians who were killed in self-defense would subject Israel to further criticism and condemnation by the international community. It’s just a puzzle wrapped inside a mystery, a strange thought process. 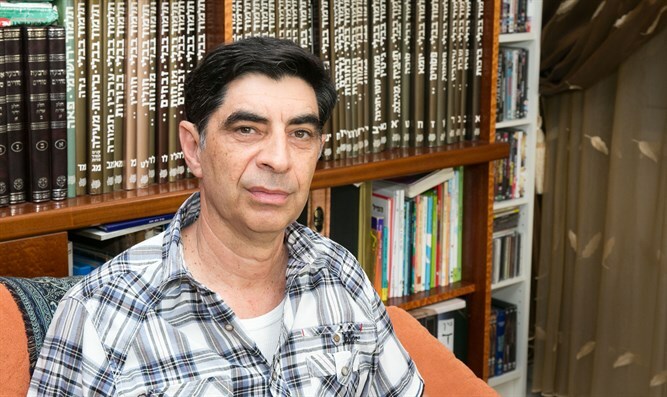 Earlier this week, Simcha Goldin was interviewed on Israel Army Radio where the interviewer, Razi Barkai, compared the situation of Palestinian terrorist families waiting for the return of their children’s bodies with that of the Goldin and Shaul families. Simcha Goldin confronted Barkai on Niv Raskin’s Army Radio program on Monday morning. “We are in a struggle to prove to the whole world that there are enormous differences between us and our enemies, and on Army Radio, Barkai compares the Shaul and Goldin families and their feelings to the families of murderous terrorists,” said Goldin. Barkai tried to explain the rationale behind his statement, but Goldin demanded an apology. In the meantime, the effort continues to appeal to the conscience of a world gone wild that will not allow parents the peace of mind associated with having a grave to visit as they yearn to remember and memorialize their sons. Instead, John Kerry and Ban Ki-moon are too busy to even offer the courtesy of a meeting so as to comfort these mourners who travel the world, as an end to their personal crisis continues to elude them. Hadar Goldin has a twin brother, Tzur, also an officer in the IDF. He has been traveling, too, speaking to audiences around the world urging that pressure be brought to bear to have his brother released. In an address last summer to a Christian group here in the U.S., he said that both he and Hadar had inscribed the same two words on their IDF-assigned machine guns. The two words are courage and humility. We need to add at least two more words—decency and dignity.